Now, I have used this Nielsen graphic in seminars and conferences for two years and always wondered when the next study is going to be published. Finally today, I came across the latest Nielsen Global Trust in Advertising report. And again, the results are similar to what they where back in 2009. People still don’t trust advertising. Well, let’s say… at least not as much as they trust recommendations from people they know like friends, family and peers. However, it is still somehow scary to bear in mind that people trust consumer opinions expressed online… very often without verifying who say what in which scenario and which stage of life. 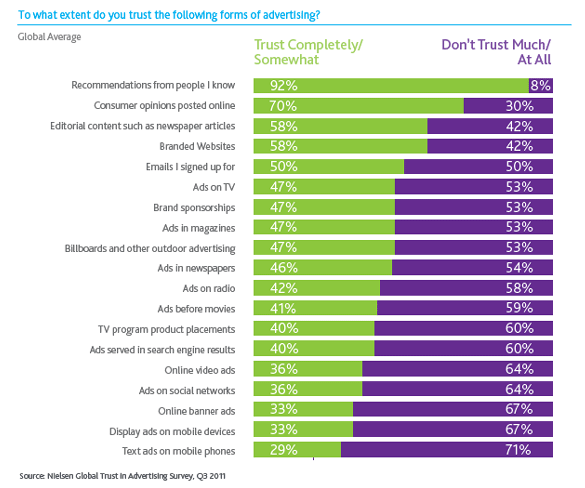 According to the Nielsen findings, which surveyed over 28,000 Internet people in 56 countries, 92% of the respondents said they trust recommendations from friends and family above all other forms of advertising. This equals an increase of 18% compared to 2007. Consumer opinions posted online come in at the second place of most trusted source. Of the consumers surveyed globally, 70% indicated they trust messages from online platforms. This makes up an increase by 15% in the last four years. Publishing houses and platforms still get a lot of trust from their users. Editorial content (58%) finished in the thread place, just before branded websites (58%), and opt-in emails (50%). The traditional platforms for advertising like print, television, and radio are significantly lower from a trust point of view. The drop in value since 2009 goes down by 24%. The results show the importance of content marketing carrying the truth about your company, brand or products. Openness, authenticity and transparency are still rated very high amongst your customers. They want to “know what they get”. They want to engage with you but also being told the truth if there is something bad or uncertain to say about brands and their development. And above all they want you to respond to their input. They want you to give them some attention, some feedback, some credit for the time they spend. Then you will earn their trust, and then they will share your voice. Study ConnectedTV - What's the leading strategy?